One of my absolute favorite things about downtown Boulder is the abundance of coffee shops. As a coffee addict I love being able to have different options to choose from. On Pearl Street you simply cannot go wrong with any local coffee shop located downtown! A hidden gem located on the West End of the mall, Spruce Confections is one of my personal favorites. Spruce Confections is a coffee house and bakery that makes all their baked goods from scratch. It is the perfect meeting place with a unique patio surrounded by trees, funky red chairs and matching tables. You can’t go wrong with of their assortment of cookies, cakes, scones, croissants, sandwiches and quiches which all pair perfectly with their coffee and tea menu. Another one of my favorite Pearl Street coffee houses is Boxcar Coffee Roasters. Boxcar and Cured share a space on the East End of Pearl. Get an afternoon pick me up at Boxcar and wander over to Cured to grab one of their elegant cheese plates for later. The perfect place to do work or even meet with friends for a cup of coffee to catch up. This place is seriously aesthetically pleasing as well as delicious! For breakfast I like to head over to The Cup Espresso Cafe for one of their amazing bagel breakfast sandwiches or avocado toast paired with a vanilla latte. The Cup has a lengthy tea selection and they also have amazing milkshakes. I recommend trying the chai tea milkshake! One of my favorite places to get work done on Pearl is the Laughing Goat Coffeehouse. 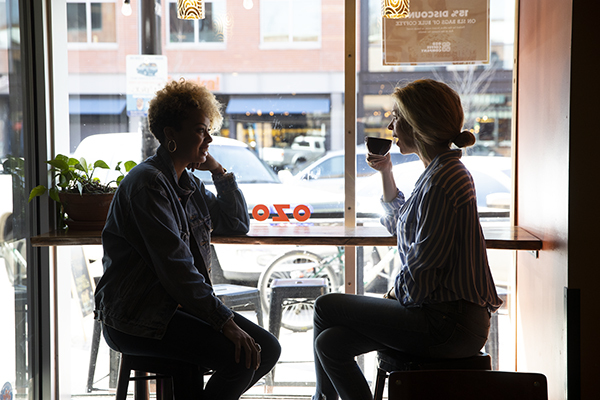 With delectable baked goods, amazing coffee, and a warm and cheerful vibe the Laughing Goat is the perfect coffee shop. Open later than most coffee shops downtown, the Laughing Goat also hosts live music, poetry readings and has an array of art on display. You don’t want to miss this unique, one of a kind spot! Another coffee shop that I am a regular at is Ozo, located on the West End of the mall, it’s always bustling and a great place to meet up with friends. Enjoy your coffee on the cozy patio out front or inside their warm, welcoming interior. If you love a good mocha like me, I recommend trying their Almond Joy Mocha, which is dark chocolate with almond and coconut. If I don’t have a mocha at Ozo I usually grab their iced coffee which is equally as delicious and always hits the spot! Ozo sells other incredible local products too like Bobo’s oat bars, Noosa yogurt, Spruce Confection baked goods and kombucha! The local coffee shops are just another great feature of downtown Boulder. You definitely cannot go wrong with any of the coffee shops on Pearl! So what are you waiting for? Get sippin’! For a complete directory of coffee spots, check out our listings!